Charged with treason under Theodoric the Great in sixth-century Rome, Boethius served one year’s imprisonment, awaiting trial and eventual execution. During this time, he wroteÂ The Consolation of Philosophy, which would go on to be one of the most popular philosophical works of all time, contributing much to medieval thought and influencing the likes of Dante and Chaucer, as well as Renaissance writers such as Milton and Shakespeare. 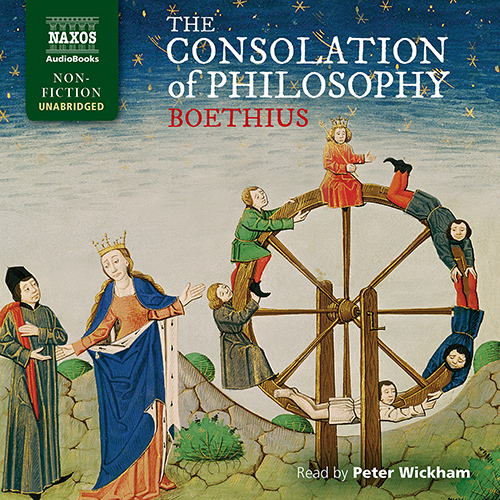 Grieving over the injustice of his imprisonment, Boethius meditates on the nature of God, the fickleness of Fortune, the idea of free will, why bad things happen to good people, and the nature of happiness. His arguments take the form of a rich and exquisite dialogue between himself and Lady Philosophy, and make many allusions to classical Greek and Roman literature in an attempt to create a coherent philosophy that supports his world view. It has been declared a ‘golden volume not unworthy of the leisure of Plato or Tully’ (Edward Gibbon).